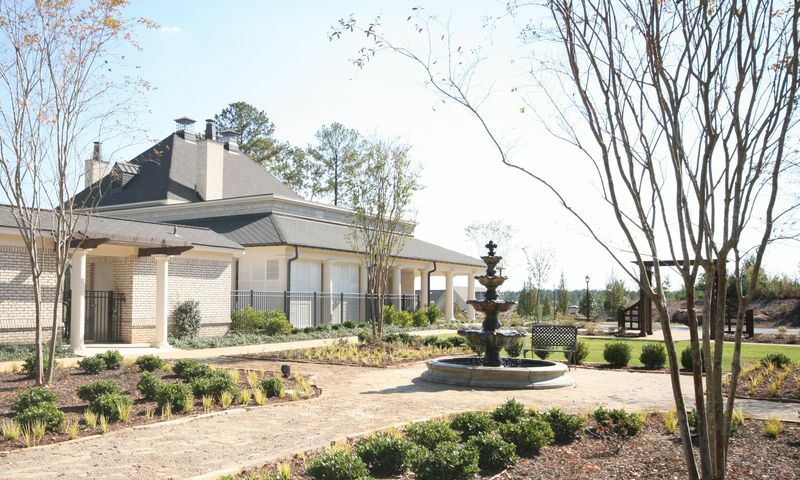 The Legacy at Cary Creek is a gated 55+ community located in Auburn, Alabama. The Legacy at Cary Creek is part of the master-planned development of Cary Creek. This private active adult neighborhood will consist of 143 homes across 57 acres of scenic landscape dotted with mature trees, ponds and a stream. Homeowners can enjoy well-appointed amenities at the clubhouse, unique home designs, and a picturesque neighborhood setting for residents aged 55 and better. The central hub of social and physical recreation is the 3,500 square-foot clubhouse in The Legacy at Cary Creek. Active adults can stay healthy by utilizing the fitness center. They can mingle with neighbors in the great room, play a game of billiards, or prepare a snack in the catering kitchen and enjoy it in the dining area. Outdoor amenities include a swimming pool, sitting porch and living nook area, community gardens, and an outdoor kitchen. Residents will also be able to stay active outside by playing a few games of bocce ball, pickleball, or croquet. The Legacy at Cary Creek is surrounded by scenic walking trails that active adults can enjoy as well as three ponds and a stream that accents this 55+ neighborhood. The Legacy at Cary Creek will consist of 143 single-family homes. Builder Michael Allen Homes offers ten distinct floor plans that can be personalized with optional second floors or basements. Each single-family home is designed with the active adult in mind by providing stair-less entries, accessible layouts, and main-level living. These single-family homes range from 1,956 to 2,630 square feet of living space. They have two to six bedrooms, two to six bathrooms, and an attached two or two-and-a-half-car garage. All homes feature luxurious master suites, spacious floor plans, plenty of storage space, a porch and sun-filled garden room. Homeowners' association dues include landscaping, maintenance of common areas, and use of amenities. Homeowners can enjoy an active and social lifestyle at The Legacy at Cary Creek thanks to the on-site property manager who will organize activities and events for residents. They can dance the night away, attend tailgating parties, or play bocce ball, pickleball, and croquet to stay busy. They can also relax by the pool with a good book or start a club of their own with neighbors based on shared interests. As the community develops and continues to grow, residents are sure to find new and invigorating ways to keep their social calendars full. Ideally located in Auburn, Alabama, residents of The Legacy at Cary Creek will have plenty of shopping, dining, and entertainment attractions nearby. Residents can head down the road to the Shoppes at Cary Creek, which has a Publix grocery store, restaurants, and other commercial establishments. Auburn University is only seven minutes away and offers lifelong learning classes, sporting events and entertainment attractions on campus. When traveling farther is required, residents can board a flight at Montgomery Regional Airport that s 64 miles away or Atlanta s Hartsfield-Jackson Airport, which is 87 miles away. Active adults will enjoy everything that The Legacy at Cary Creek has to offer 55+ homeowners in Lee County, Alabama. There are plenty of activities available in The Legacy at Cary Creek. Here is a sample of some of the clubs, activities and classes offered here. The Legacy at Cary Creek offers ten distinct floor plans that can be personalized with optional second floors or basements. These single-family homes range from 1,956 to 2,630 square feet of living space. They have two to six bedrooms, two to six bathrooms, and an attached two or two-and-a-half-car garage. Please Note: Not all floor plans are available at this time. Where to start...the initial concept of this community was to depict, showcase and build beautiful homes with southern charm. The original physical property had beautiful trees and character, the developer stripped the interior grounds of all substantial trees and now only perimeter foliage remains. It's now a wide-open tract of land that bakes in the hot Alabama summer temps. The interior home options are not designed for the active senior; the rooms are cramped and very small, tiny front porches, ugly front load garages on many models, scaled down interior custom options that are NOT ADA friendly do equate to a retirement "dream home". At the end of the day, the development is nothing special. Such a great community in one of the nicest areas of Alabama. Auburn is so great. Homes here are well built and love the clubhouse! 55places.com is not affiliated with the developer(s) or homeowners association of The Legacy at Cary Creek. The information you submit is distributed to a 55places.com Partner Agent, who is a licensed real estate agent. The information regarding The Legacy at Cary Creek has not been verified or approved by the developer or homeowners association. Please verify all information prior to purchasing. 55places.com is not responsible for any errors regarding the information displayed on this website.